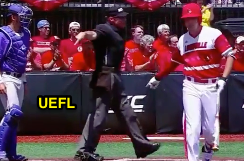 Friday's college baseball action featured a runner's and declined catcher's interference call as the NCAA Super Regional round saw its fair share of illegal hinderance in College Station and Louisville. The two plays illustrate that not all interference is committed by the offense (at least, not at the pro level). Runner's interference is called at third base. Runner's Interference: We begin with a crucial runner's interference play in the bottom of the 12th inning of Friday's Davidson-Texas A&M game. With one out and one on (R2), the batter hits a ground ball near third base. As the third baseman attempts to field the ball, he collides with the advancing baserunner in the baseline. Although the baserunner did not appear to have intended to interfere, his collision with the third baseman prevented the fielder from fielding the batted ball, and is a violation of the interference rule at all levels of play. NCAA Rule 2-51 defines this brand of interference as "The act of an offensive player, umpire or nongame person who interferes with; physically or verbally hinders; confuses; or impedes any fielder attempting to make a play." By contrast, the Official Baseball Rules used at the professional level states, "Offensive interference is an act by the team at bat which interferes with, obstructs, impedes, hinders or confuses any fielder attempting to make a play." And high school's NFHS Rule 2-21-1 states, "Offensive interference is an act (physical or verbal) by the team at bat—a) which interferes with, obstructs, impedes, hinders or confuses any fielder attempting to make a play; or b) when a runner creates malicious contact with any fielder, with or without the ball, in or out of the baseline; or c) a coach physically assists a runner during playing action." The only significant takeaway from this comparison is that offensive interference may be physical or verbal in high school and college, but must be physical in the pros. NFHS also includes malicious contact in its definition of offensive interference. Other than that, the same basic terminology (interferes with, obstructs, impedes, hinders, or confuses) is essentially identical for all levels. NCAA Rule 8-5-d: "A runner is out when—[the runner] interferes with a fielder who is attempting to field a batted ball." OBR 6.01(a)(10): "A runner is out when—he fails to avoid a fielder who is attempting to field a batted ball." NFHS 8-4-2-g: "Any runner is out when—he hinders a fielder on his initial attempt to field a batted ball." Again, the three rulesets are fairly identical. One fielder is protected per batted ball (umpire shall decide which one is entitled to field the ball), and only until he either successfully fields it or errs, wherein the ball bounds away and is no longer in the fielder's immediate reach (NCAA/OBR) or he must vacate his original position (NFHS) to field it. In College Station, the runner interfered with the fielder as the ball was arriving. Textbook interference. Catcher's interference is called at home plate. Catcher's Interference: With one out and two on (R2, R3) in the bottom of the 1st inning of the Kentucky-Louisville game, the Kentucky catcher's glove made contact with the Louisville batter's bat as the batter swung at the pitch, hitting a ground ball to the shortstop, who threw to first base for an out as the batter campaigned for interference at the plate. NCAA Rule 8-2-e states, "the batter becomes a base runner—if any defensive player interferes with the batter’s swing or prevents the individual from striking at a pitched ball. If a play follows the interference, the offensive team may elect to ignore the interference and accept the play. However, if the batter reaches first base and all other runners advance at least one base, the interference is ignored." OBR: "Defensive interference is an act by a fielder that hinders or prevents a batter from hitting a pitch"..."The batter becomes a runner and is entitled to first base without liability to be put out (provided he advances to and touches first base) when—The catcher or any fielder interferes with him. If a play follows the interference, the manager of the offense may advise the plate umpire that he elects to decline the interference penalty and accept the play. Such election shall be made immediately at the end of the play. However, if the batter reaches first base on a hit, an error, a base on balls, a hit batsman, or otherwise, and all other runners advance at least one base, the play proceeds without reference to the interference." (5.05(b)(3)). NFHS 5-1-2-b: "It is a delayed dead ball when—a catcher or any fielder obstructs a batter or runner; or obstructs the ball through use of detached player equipment." 8-1-1-e: "A batter becomes a runner [when]...the catcher or any other defensive player obstructs him. The coach or captain of the team at bat, after being informed by the umpire-in-chief of the obstruction, shall indicate whether or not he elects to decline the obstruction penalty and accept the resulting play. Such election shall be made before the next pitch (legal or illegal), before the award of an intentional base on balls, or before the infielders leave the diamond. Obstruction of the batter is ignored if the batter-runner reaches first and all other runners advance at least one base. (1) Any runner attempting to advance (i.e., steal or squeeze) on a catcher’s obstruction of the batter shall be awarded the base he is attempting." Though OBR is the only code to specifically define "defensive interference," while NFHS insists on the term "catcher's obstruction," and NCAA calls the play "obstruction" in Rule 2-55, but "catcher's interference" in 8-2-e (in other words, the NCAA book contradicts itself in verbiage, but not in administration of the penalty), the plays and penalties are similar at all levels: in addition to giving the offense a choice of outcomes and disregarding the interference (OBR, half of NCAA)/obstruction (NFHS, the other half of NCAA) if the batter and all runners advance at least one base safely, all codes additionally award runners bases on this interference/obstruction if they are otherwise attempting to advance, and charge the pitcher a balk only if a runner is attempting to steal home at the time of the illegal catcher-batter/bat contact. Hypothetical: Combine both plays and assume the interfered-with batter grounds to third base, where the baserunner collides with the fielder. The proper call would be to enforce the catcher's interference/obstruction penalty, since this occurred first and supersedes the later runner's interference (for instance, because the catcher's conduct contributed to the ball being hit to third base in the first place). If there is malicious contact between runner and fielder (NFHS), any applicable ejection penalties would stand (if the runner were to be ejected for MC, that player would be disqualified and a substitute runner placed at second base). Videos available via johnnyg08 & "Read More"